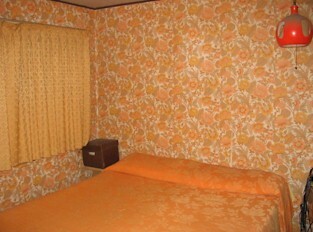 click here to see photos of 2001 LDS-RT project! 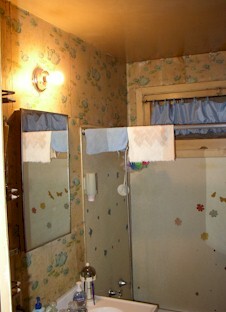 click here to see photos of 2002 LDS-RT project! 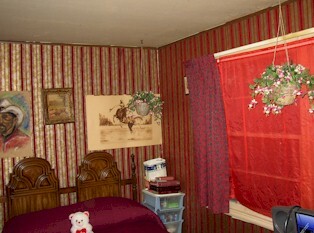 click here to see photos of 2003 LDS-RT project! Background: This home belongs to an elderly couple with a lot of cars, car parts and yard debris to remove in their backyard, exterior prep and painting to do, and interior wallpaper to remove and painting in the bedrooms, bathroom, and living room. The homeowner is a very sweet elderly lady, who has hired some extremely bad contractors. 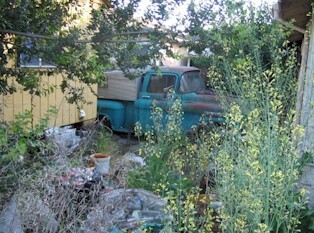 Left side of house - remove inoperative red pickup truck & contents, piles of stuff in front of red truck, remove engine, transmission, and other large objects in backyard, and pickup truck in far background. Segregate recyclables (bottles and cans), and load in a pickup truck & van to be provided by Jay. Push red truck and pickup in front onto driveway to be removed by towing company. 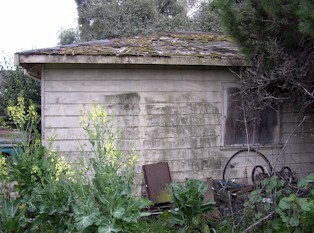 This is a rear view of the house. 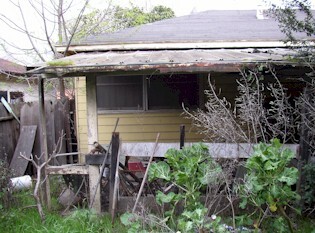 There is a lot of stuff to remove from behind the house as well. We should separate as much metal as possible so we can recycle as much as possible. 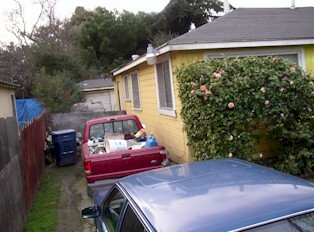 This is the side view of the garage looking toward the driveway. 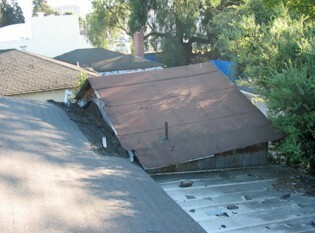 The roof is completely gone, and we may replace it if safe to do so. We will paint the exterior walls. Much of the contents of the garage will go to the dumpster on rebuilding together day. Again, the key to this project is to separate the metal and other recyclables from the garbage. The buried car will be pushed out and towed. This is the horrific addition, viewed from the roof. We're going to install a roof cricket, by cutting in a gable extending to the addition, put in some valley flashing, and integrate the roof of the addition into the roof of the main building. We are principally doing this because the joint between the two buildings currently forms a continuous waterfall during rainstorms, as seen below. 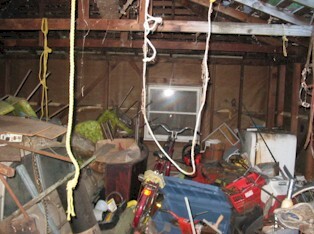 This is taken from inside the horrific addition, viewing the rear of the house. 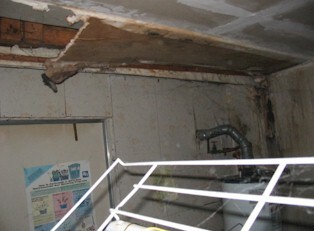 The pulled-down sheetrock is the joint between the addition and the house, where a continuous wall of water runoff from the roof enters the main house.